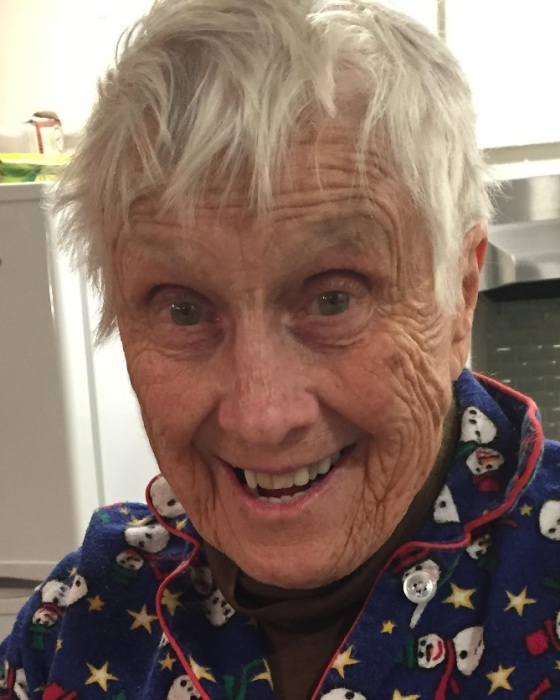 Muriel “Bebe” (Clark) Swanecamp, 87, a longtime resident of Framingham and South Dennis died peacefully in her sleep on Thursday morning, January 31, 2019. Born in North Adams, she was the daughter of Arthur R Clark & Josephine (Kingberger) Clark and the beloved wife of 54 years to the late Raymond J Swanecamp. Bebe was educated in her early years in Greenfield and moved to Framingham where she graduated from Framingham High. Afterwards, she attended nursing school in New York City. For 25 years, she worked at Howard Johnson’s on the Mass Pike. She proudly worked as a Town of Framingham crossing guard for close to 20 years. Crossing the children “at her post” was Bebe’s passion and brought her tremendous joy. Bebe will be remembered for her boundless energy, her kindness and living life on her terms. In 1978, Bebe and Ray built a house in South Dennis. Their Cape Cod house was a favorite vacation spot for their children, grandchildren, friends and relatives. Over the years, these gatherings created many fond memories that Bebe cherished. She is survived by her children Gail Barss of Southborough, Karen Curtis & her husband Mark of Medway, Kevin & his wife Kathy of Holliston, Brian and his partner Robert Acone of Tewksbury, Gary of Framingham, David of South Dennis, Thomas of Monarch Beach, CA, Her grandchildren, Sheilah Curtis Cowherd & her husband Chris, Michelle Kelley & her husband George, Jenni Rae Curtis, Brian Barss, Danielle Daly & her husband Ryan, Christopher, Craig & his wife Nicole, Gabrielle, George Phipps, Katelyn & Corey Shaw and Christina Curtis. Bebe was blessed with 17 great-grandchildren and 2 great-great grandchildren and many nieces and nephews. Besides her husband Ray who passed away in 2006, Bebe was predeceased by her brother Buddy Clark, sisters Jeanne Robichaud and Jo Anne Clark and her son-in-law David Barss. Family and friends will honor and remember Bebe’s life by gathering for visiting hours in the McCarthy, McKinney & Lawler Funeral Home, 11 Lincoln St. Framingham, on Monday February 4th from 3 – 8 P.M. Her Funeral Mass will be celebrated in St. Bridget’s Church, 830 Worcester Rd. (Rt. 9 E) on Tuesday morning at 9 o’clock. Interment will take place privately. In lieu of flowers, a donation may be made in Bebe’s memory to Ed Convery Scholarship, 7 Pinewood Drive, Framingham, MA 01701.